Unravel some more great shows. Parasyte: The Maxim centers around Shinichi Izumi, an ordinary high school student whose life takes a turn for the worse when parasitic aliens mysteriously drop from the sky overnight and take over the brains of innocent human beings sleeping below. Izumi finds himself struggling against one of these life forms, though thankfully prevents his brain from being taken over by cutting off blood circulation to his arm. 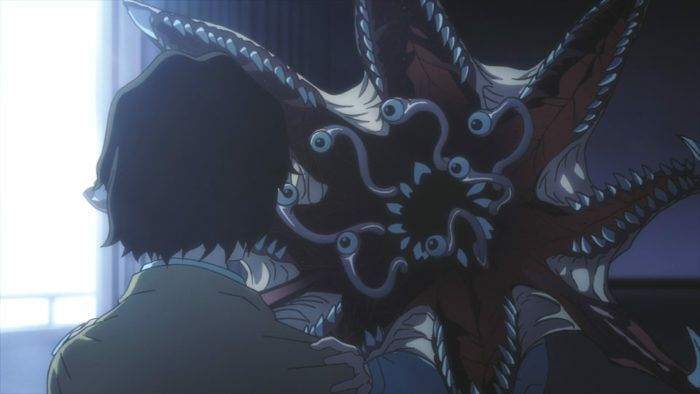 Deeming itself a failure, the parasyte, Migi, agrees to help Shinichi rid his Japanese town of other parasites lest both of them die from the alien threat. Tokyo Ghoul’s Kaneki Ken and Shinichi share a lot in common, most notably when it comes to the fact that neither protagonist asked for the situations they were thrust in. Both must use their newfound abilities to their advantage in order to survive against enemies of their own kind – Kaneki with ghouls and Shinichi with parasytes. Each character also undergoes a profound change as events unravel, becoming colder and less human as time goes by. Combat also plays out in a very similar way, as both young men must cleverly figure out their opponent’s moves to make up for the fact that they’re still new to the whole anime protagonist thing.